The College of Eastern Utah Theatre Department announces its final production of the 2003-2004 season, “Something’s Afoot.” The book, music and lyrics are by James McDonald, David Vos and Robert Gerlach. “Something’s Afoot” is a zany, entertaining show that takes a satirical poke at Agatha Christie mysteries and musical styles of past years. Ten people are stranded in an isolated English country house during a raging thunderstorm. One by one they’re picked off by cleverly fiendish devices. As the bodies pile up in the library, the survivors frantically race to uncover the identity and motivation of the cunning culprit. The cast includes Jacob Dickey, Melissa Trowbridge, Sam McGinnis and Amy Rasmussen, of Price; Sheri Gillies, Layton; Jared Crown, Salt Lake City; David Bohnet, Orem; Alexis Cline, West Jordan; Phil Smith, Magna; Lorin Bruns, Tooele; Diana Halford, Farmington. The production is stage managed by Angie Roundy. 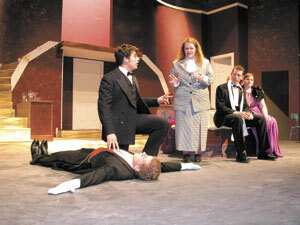 “Something’s Afoot” will play April 15-17 & 19-20 at the Geary Theatre, 350 East 400 North in Price. Curtain is at 7:30 p.m. each evening. The production is directed by Grady McEvoy. Tickets range from $2 to $7. Box office opens each night at 7 p.m. Reservations can be made and further information at (435) 613-5334.